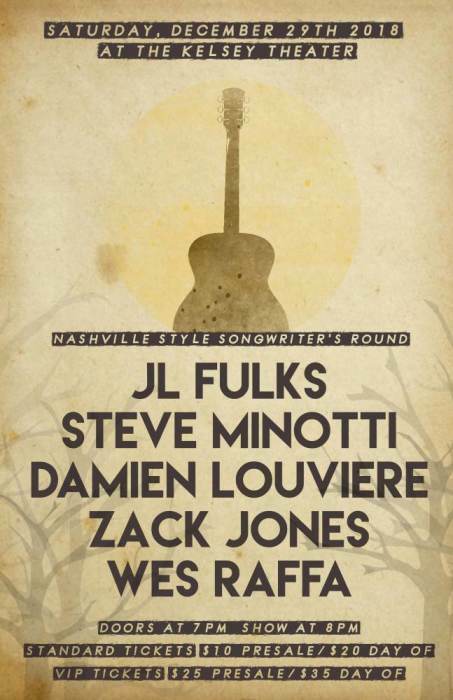 Join us Saturday, December 29, for a Nashville Style Songwriter's Round! 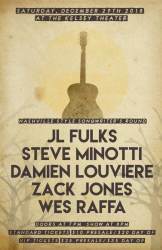 Presented by Snorkel Corn Entertainment, This is an authentic "In the Round" presentation featuring JL Fulks, Steve Minotti, Damien Louviere, Zack Jones & Wes Raffa. General Admission (Seated Show) $10 tickets, $20 day of show & $25/$35 VIP for the first 3 rows (plus taxes and fees). All ages, doors at 7 PM show at 8 PM, bar with ID. JL Fulks : at 24 years old, JL Fulks has already lived the dream that most musicians work their whole lives to achieve. JL has relocated to South Florida and started fronting his own trio again performing at the best clubs in South Florida. JL continues to collaborate with many artists and plays as a part-time sideman for some legendary blues musicians. He is also a substitute teacher at the school of rock and is asked frequently to record on many artists records. A new EP being produced by David Shelley is in store as well as more touring. JL recently opened for Tab Benoit and is in booked for more openings in the future. Catch this rising star at a venue near you! Steve Minotti : Originally from Bridgeport, Connecticut, Steve Minotti now resides in Deerfield Beach, Florida. Steve started performing and captivating audiences at the age of 17. He has played coffee houses, clubs, festivals and concert venues all over his home state of Florida and along the East coast. These include Kenny’s Castaways in NYC & Douglas Corner Café in Nashville, In 1992, he spent a month touring Brazil along with his band Peace Man. Steve has opened up for Donna The Buffalo and Blues Traveler at the 2008 Garlic Festival. He was cast as Neil Diamond in the recreation of “The Last Waltz” at the Crest Theater at the Delray Beach Cultural Arts Center. Steve was a regular at the legendary Elwood’s Dixie BBQ in Delray Beach for 9 years. Damien Louviere : Damien Louviere is an accomplished singer/songwriter and recording artist from Louisiana. His music is a mix of Indie Folk, Rock and Psychedelic Pop accompanied by enticing melodies and lyrics about life, love, and the human condition. Growing up in Pensacola, FL and later moving to New Orleans, Damien used the region as a tapestry to develop his style of writing and love for Folk, 20s and 30s Blues, Jazz, Cuban and Indie music. He currently resides in Jupiter FL. Damien recently released an EP, Partial Brother, Featuring an all star lineup including Tyler Greenwell (Tedeschi Trucks Band) Sean Peterson (The Possibility Wave, Col. Bruce Hampton and the Code Talkers) Jake Walden, Tobi Echevarria (Holopaw) and Aaron Finlay (PRECUBED). Zack Jones : Zack Jones is the founder of Snorkel Corn Entertainment and frontman of Americana quartet, Gravel Kings. With more than 20 years of creating music under his belt, Jones has become a staple in the Treasure Coast music scene and his music has been described as “a rollicking revelation that hugs the contours of country, folk, rock and Americana, with stories of love, longing and leaving that burst with graceful harmonies and just the right amount of twang, “ - (Ben Crandall, Southflorida.com). Wes Raffa : Wes Raffa, 24 is a musician from Stuart Florida. He enjoys playing the local circuit but hopes to maybe one day ghost write for some bigger musicians or even preform on his own. Wes is currently working on his first EP project March to the Bear. Some of his biggest influences are Radiohead, John Mayer, City And Colour, Jimi Hendrix, and Grizzly Bear.